Smoke Detector Beeping? This Is What You Need To Do! It’s always the same; you’re just getting to sleep when you hear an annoying beep beep sound coming from outside the bedroom. It may take a few moments to recognize, but you know you’ve heard that sound before – it’s the smoke detector. Let’s get this straight; we’re not talking about the high-pitched ear-splitting sound of the alarm itself. When that goes off, it can wake even the heaviest of sleepers, and it should be treated as an emergency until proved otherwise. What we are discussing is the chirping noise smoke alarms make, usually at the most inconvenient times. Smoke alarms can emit two types of chirping to signify different things. There is a consistent, regular beep beep, or an intermittent pattern of chirping with no apparent regularity. The cause of the beeping can be a number of things and sometimes depends on whether the smoke alarm is hard-wired into a building’s mains electricity, or if it is solely battery powered. There are a number of reasons why a smoke alarm may give off a steady beep. ✓ If the alarm is chirping every 30 to 60 seconds, the most obvious cause is that the battery powering the device needs to be changed. ✓ If the red LED light on the smoke alarm is flashing, and the alarm is beeping then the battery-powered device has malfunctioned and needs to be replaced. ✓ If your smoke alarm has a hush feature, the alarm will bleep about every 30 seconds for up to seven minutes after it has been activated. ✓ If you can not replace the batteries on your smoke detector as it is a sealed unit, and the chirping continues every 30 seconds, this is the indication the alarm needs to be replaced as it has come to the end of its life. ✓ If you have a smart smoke detector, that works wirelessly with other devices and controls in the home, then the chirping can be caused by interference from another system in close proximity. Check to see if any of these are causing the irritating noise. ✓ The connection to the battery may be loose, or it has not been put in correctly. ✓ The chamber inside the alarm that detects smoke may be dirty. ✓ If there is high humidity or steam in the room, this can also affect a smoke detector and force it to beep. ✓ If the smoke detector is mains powered then a fault in the connection could be causing power to the detector to be interrupted and thus setting off the beep alarm. ✓ It may be that the alarm is old and has reached the end of its working life. ✓ Once a smoke alarm starts to beep, it will keep on doing so until an intervention is made, either to switch off the device and reset it and to change the battery. The first thing to do is to power down the detector by switching it off at the mains breaker box. Remove the smoke detector from its mounting bracket on the ceiling and unplug the power cable. Open the housing for the backup battery and remove it. Press the ‘Test’ button by holding it down for about 15 seconds. The alarm should sound for a little while and then go silent. Replace the backup battery with a new one. Reconnect the power cable to the smoke alarm and return the device to its mounting bracket on the ceiling. To indicate power has been restored to the device, it should beep once. Remove the smoke detector from its mounting bracket on the ceiling. Open up the battery compartment, remove the old battery. Hold the ‘test’ button down for about 15 seconds, which should force the alarm to sound for a few seconds and then stop. Insert a new battery into the compartment, ensuring the connections are firm and not loose. 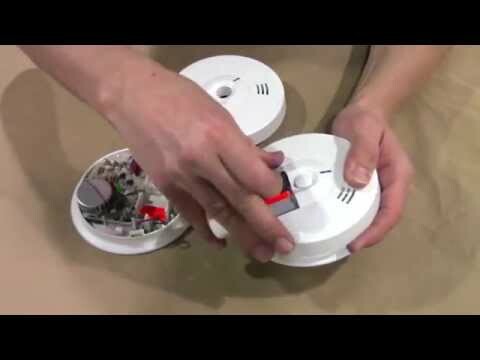 The smoke alarm should beep once to show a new battery has been connected and it is functioning properly again. It is always important to make sure smoke alarms are working properly, so it is advisable to test them on a monthly basis. Smoke detectors have a limited lifespan and need to be replaced every few years as the material inside which detects the presence of smoke deteriorates over time.